Price is reduced to rock bottom! Take advantage of this low price pizza business!! The absentee owner is moving on to new opportunities and wants to sell his restaurant that's done pizzas. Take advantage of this fantastic opportunity. This business has unlimited room for growth. Lease has over 6 years remaining. This is one of the best locations in Sacramento County, a very upscale shopping center and surrounding community. The hard work is already done- you can turn the key and start your own business. 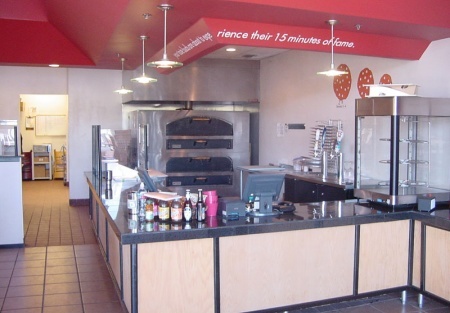 This franchise pizza restaurant has an emphasis on healthy foods - serving pizza, sandwiches and salads. The restaurant is just like new - it was professionally designed, and looks beautiful!! For the asking price of this business, you could not even start to build out your own restaurant. If you want to get into a turn key operation, and save about 50% of the cost to build new, this is your place. Take the next step and complete the online confidentiality agreement and you'll be provided with the restaurant name and address. Also you will given priority notification to new listings in the future, prior to the general public, giving you the best chance to "scoop in" the best opportunities. There are also more photos available to our registered buyers. Owner must sell!!! Take advantage of this low price! !